To start exploring New Delhi head to its royal mall, Rajpath, the capital’s hub. An attraction in itself, with inviting green spaces perfect for picnics, at its eastern end is the Arch-de-Triomphe style India Gate. This 42m high stone war memorial pays tribute to the estimated 90,000 Indian soldiers who died in WWI, the Northwest Frontier operations, and the 1919 Anglo-Afghan War. At the opposite end of Rajapth’s grand parade is the palatial Rashtrapati Bhavan, originally built for the Viceroy and now the official home of the President of India. It’s worth booking? ahead to take a look inside this incredibly grand building, where you can visit the presidential library, and the vast Durbar Hall and Ashoka Hall. At the capital’s northern edge is Connaught Place, the heart of downtown Delhi. Surrounding its white colonnaded verandas you’ll find the city’s best concentration of shops, restaurants and bars, circling a central park. To the south are the Lodi Gardens, a peaceful space that’s a popular spot to get away from it all. As well as pretty lawns and vibrantly coloured flora, the park also has an enchanting lily-pad-filled lake, which is crossed by the stunning Athpula Bridge, which dates back to the reign of Emperor Akbar. The Lodi Gardens are also dotted with several inserting ancient monuments and tombs, including the impressive 15th-century Bara Gumbad tomb and mosque, and the tombs of Mohammed Shah and Sikander Lodi. 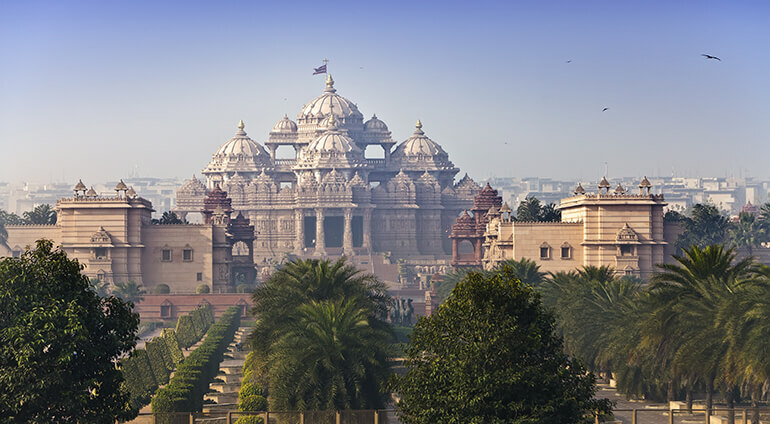 Just across the Yumana River in the eastern suburbs is the imposing Akshardham Temple, an ostentatious spiritual centre where you can see around 20,000 carved deities, saints and mythical beings. New Delhi also boasts an impressive and diverse collection of museums, including the National Museum, which explores India’s fascinating history and Gandhi Smriti, a museum dedicated to Mahatma Gandhi housed in the building where he spent the last 144 days of his life and where he was assassinated in 1948. Meanwhile, the National Museum of Modern Art’s features colonial era landscapes alongside some interesting talks and exhibitions.